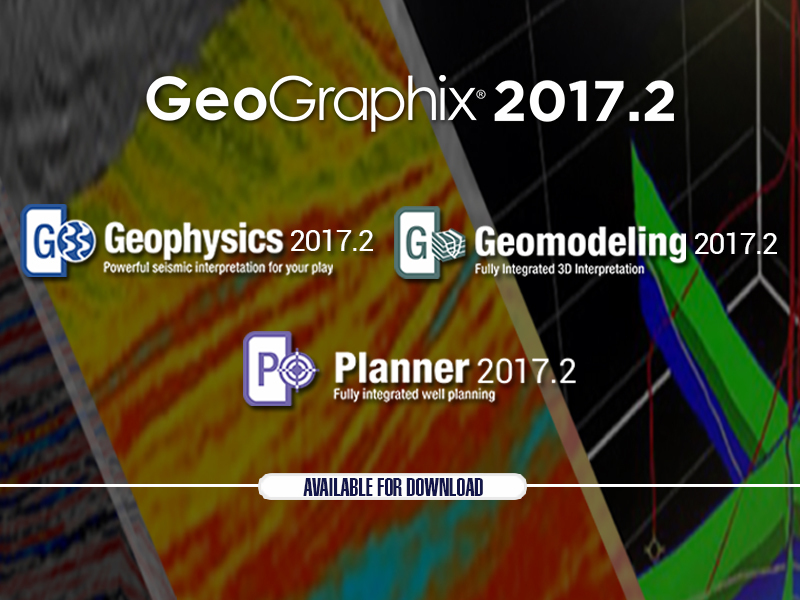 GeoGraphix 2017.2 is all about enhancing your efficiency with tools derived from customer experience and persistent R&D in the face of challenging times. 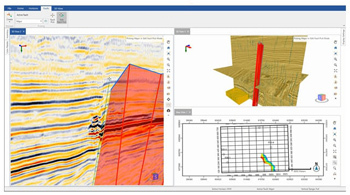 Our new release offers most advanced field planning, integrated 3D geomodeling and powerful petrophysical analysis making it the industry’s most advanced, cost efficient tightly integrated geoscience system. Clipping option is added to the Layout tab of the Cross Section Display Preferences dialog box. You can now choose to clip the log from the top or bottom so that it starts and ends where curve data starts and ends. 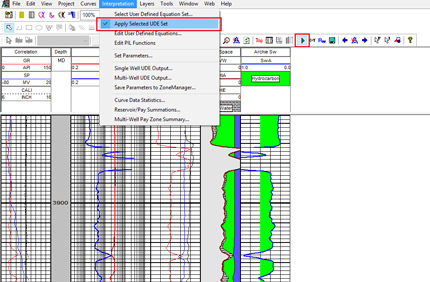 To clip the logs, go to Cross Section Display Properties dialog box and enter the desired values in the Vertical Clipping/Depth Interval group box. A new field Confidence is added to the Posting Properties dialog box. You can use it to show confidence data on the cross sections. The Distance and Angle tool is added to the Map View toolbar. You can use it to measure distance and angle between two wells in the Map View. An option for modeling the WellBase point surfaces as Triangulated Surfaces is added to the Surface Constraints tab of the GeoSurface Model Properties dialog box. 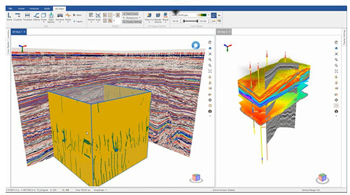 When this option is selected, the interwell points of the well-base point constrained surface are visible in the cross section view. Working in the 3D View with multiple layers is made easier with the Clipping Options toolbar. You can use the options to enable or disable clipping mode, select the objects to be clipped, and view the boundaries of objects as you clip them. Data Panel 2D and Data Panel 3D are dockable and can be placed anywhere on your workspace. Grab the top bar of the data panel and drag it to the desired location for your ease of use. 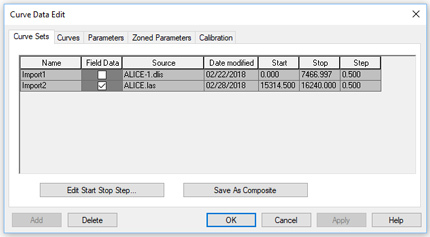 A field for Date Modified is added to the Curve Data Edit dialog box which displays the date when the curve set was imported for the first time. The date is updated if further modifications are made to the same curve data. You can also use the Date Modified as a filter for the log curve data in QueryBuilder. A toggle option is added to the Standard toolbar that enables you to quickly view the log curve with or without applying a User Defined Equation model. 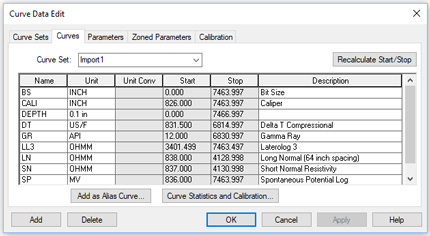 Two new fields for curve Start and Stop depths are added in the Curve Data Edit dialog box that display the values where individual curves start and stop. This information enables you to see the interval over which the curve extends. The Start Stop depths can also be used as filters in QueryBuilder. 175 more user defined core fields in core analysis. The new fields are of numeric type. These fields can be exported and imported in ASCII4 format. The data can also be imported in these fields from a spreadsheet. Two new core types have been added to Core tab. They are “Plug” and “Cuttings”. WellBase layer can be created with the Core type and the additional core analysis fields. Query Builder now has the option for additional added columns. In WellBase invalid values appeared in WellBase Bar for deleted Wells in List View, it is fixed. User was not able to move to another well after using Find well, this has been fixed. Errors in Well cloning are also fixed. In Well Header Data date is changed to current date in a specific well when activating project, it is fixed. Fixed the Calculation of wellbore for manually entered BH XYs in XY projects. Curve Data was not imported using ASCII 4 import With Bulk import Check OFF, it is fixed. Cement Type data in Casing and Liner table is moved to Cement Amount after importing IHS 297 Well. It has been fixed. DA record mapping has been fixed. Proposed Survey mapping from R1 record has been fixed. Curve Top and base depths are query able now with the Top and the Base depths of a Curve Set. Curve data LAS import date is now available for data query in Curves Section QB as last import date. Protect data function was not working correctly when user apply for a well in Scout Ticket View after highlight another well in List View, it is fixed. A brand new, intuitive and easy-to-use seismic interpretation system GVERSE Geophysics along with GeoGraphix 2017.2 for a completely integrated geoscience environment. 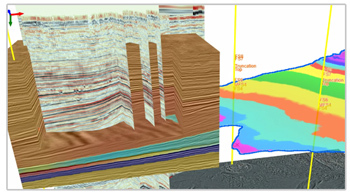 GVERSE Geophysics is a powerful new seismic interpretation system that provides powerful 3D visualization capabilities. 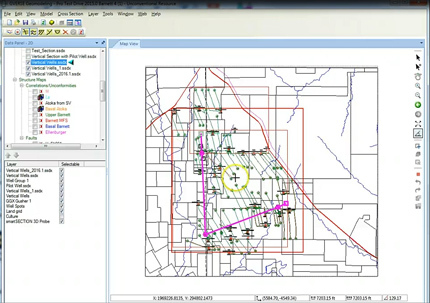 GVERSE Geophysics enables geoscientists to execute end-to-end workflows for basic interpretation and more advanced geophysical workflows. GeoGraphix 2017.2 is also part of this release with feature enhancements derived from customer experience and consistent R&D. 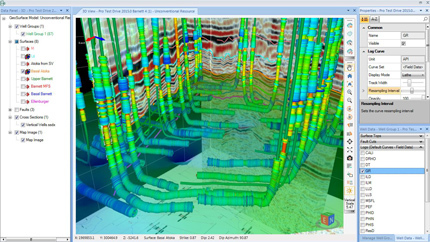 Our brand-new 3D viewer is built on an engine designed and optimized for seismic and related data. 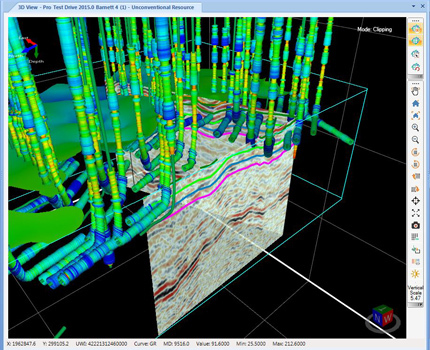 It's never been easier to view your seismic sections, horizons, faults, wells and wellbore data, and much more in the 3D space. 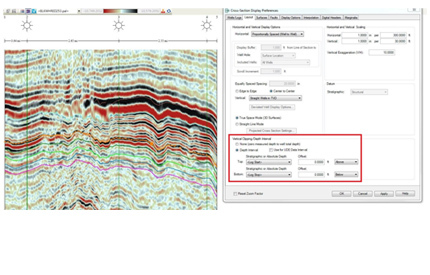 Our new LOD format does not compromise performance even with very large seismic files. With features like voxel rendering and co-blending, you can visualize subsurface structures like never before, gain more insight into your data, and make better decisions for your play. Pick your horizons and faults directly in the 3D viewer. Mark seeds picks and run the auto-trackers directly from the 3D view. With all horizon and fault picking and editing modes available, you can quickly mark your structures and instantly see what they look like in the 3D space. Import external velocity cubes and use them as your velocity model, visualize velocity values directly on your sections and horizon surfaces, or use the velocity model for T/D conversion of horizons. Our velocity modelling improvements will help you get a more accurate picture of the subsurface. Leverage the latest technology to minimize your learning curve and focus on what's important. No more digging through tons of menus and dialogs to find what you are looking for. Our multi-screen enabled, ribbon-based interface puts everything you need right in front of you. 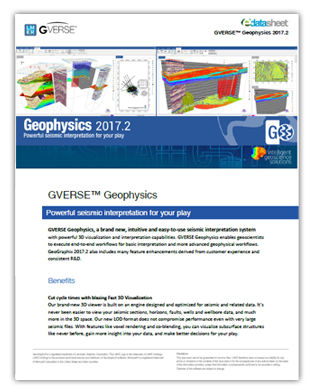 Learn how GVERSE Geophysics 2017.2 can help you Discover Productivity.